The Mid-Atlantic Road Racing Series (MARRS) held its sixth regional SCCA Club Racing event of the 2012 season on Saturday June 9th and Sunday June 10th at Summit Point Raceway in Summit Point, WV. As with the previous MARRS races in 2012, Larry and Ted Cahall practiced on Friday and brother Bob joined them late Friday night for two days of racing. Ted again ran in three classes: SM, SM5, and STL. Bob and Larry each ran in the SM and STL classes. The run groups were set as follows: SM5, SM, and then STL with all three brothers in SM and STL and only Ted is SM5. 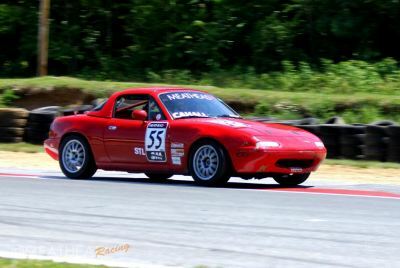 On Saturday, Ted finished 4th in the SM5 race. The SM race had Ted finish 11th, Larry 15th, and Bob had an accident on the first lap that knocked him out for the race for a DNF out of a 23 car field. For the STL race, Ted took 1st, Larry 2nd, and Bob took 3rd place. On Sunday, Ted took 3rd place in the SM5 race. He accomplished this by coasting across the finish line after running out of gas in turn 9 but determined to take his podium finish in the hotly contested SM5 class. In the SM race, ted again took 11th place while Larry finished 19th and Bob 22nd in a 24 car field. Larry ran what may be his fastest lap ever at Summit point with a 1:31.074. For the STL race, as with Saturday, Ted again took 1st, Larry 2nd and Bob took 3rd place.